Ah, clip shows. The bane of modern television. Okay, I’m being a bit harsh. 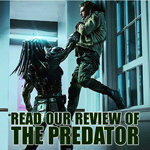 After all, home media is a relatively recent invention. Up until the past couple of decades, it seemed that most people would only catch their television shows on… well, television. 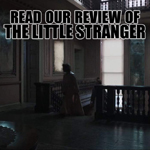 The audience was generally thought to be somewhat transient, the realities of scheduling and life making it highly unlikely that everybody would see everything. Indeed, most fans of old television shows found themselves at the mercy of fickle network schedules. 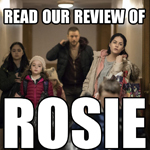 Particularly for long-running shows, it was reasonable to assume that a significant portion of your audience might not be intimately familiar with the show. 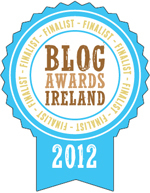 Of course, the emergence of DVD box sets and on-line streaming have radically changed the way that television operates. Most obviously, there has been a massive a swing towards serialisation in the past few years, overlapping with the expansion of home media. While it’s tough to imagine a show like The Wire or Game of Thrones working in the early nineties, the fact that people can record and download and own their television shows means that producers can get away with assuming that everybody has seen everything. What I’m getting at here is that there was a time when clip shows were an understandable, maybe even desirable, part of the network television landscape. 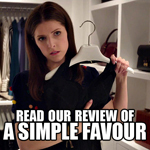 They could bring new viewers up to speed, or allow old viewers to celebrate the favourite parts of the show that they would otherwise never see again. Indeed, The Menagerie, the only two-part episode of the classic Star Trek, has a better excuse than most. The clip sections of this adventure are taken from the 1964 pilot, The Cage. Not only was this footage two years old when The Menagerie was broadcast, it had also never been aired. There was a time when The Cage was something of a ghost among Star Trek fandom. Gene Roddenberry would take it to conventions and show it to those in attendance, but it wasn’t until after Star Trek: The Next Generation came on the air that the show was broadcast on network television. Since then, of course, the episode has been included in VHS releases and DVD box sets. The adventures of Christopher Pike have been incorporated into various media, really starting with D.C. Fontana’s Vulcan’s Glory in 1989. Pike has featured in his own books as part of crossovers, and played a significant role in the 2009 Star Trek reboot. The Cage won’t ever be “just another episode” of Star Trek. Its place in the canon is too sacred for that. However, it is a lot less exotic than it was over two decades ago. As a result, The Menagerie has lost a lot of its cache, a lot of its uniqueness. And, to be honest, I’d be lying if I argued that The Menagerie was “the best way to watch The Cage” or anything like that. 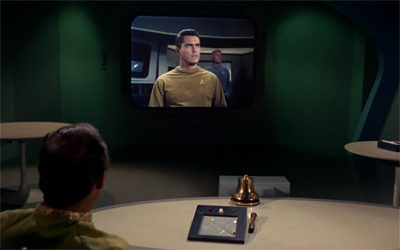 The insertion of Kirk and the modern Enterprise into the story undercuts the segments from The Cage, because nothing slows down a pulpy science-fiction adventure like court room scenes. Indeed, I can honestly see why the broadcast and production order for The Menagerie and Court Martial are so different. 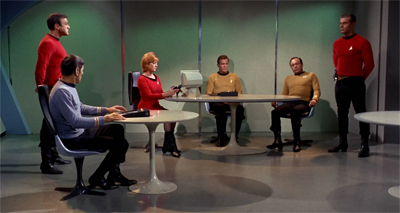 By the time we reach the end of The Menagerie, Part II, we’ve had three solid hours of court room drama in Star Trek. The concept of putting one of our crew on trial was novel in Court Martial. Unfortunately, doing a two-part adventure about directly afterwards makes it seem like the show has run out of ideas. Given some of the gems waiting towards the end of the season, we know that isn’t the case. When Mendez points out that the evidence does not support that assertion, Kirk won’t hear of it. “Then I suggest the record tapes have been deliberately changed,” he argues. 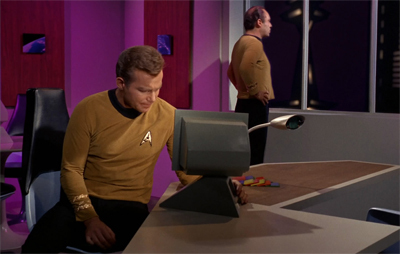 “A computer expert can change record tapes, duplicate voices, say anything, say nothing.” Of course, not only does the episode play out Kirk’s suggestion with a wonderful irony (with Spock as the “computer expert” in question), but Kirk also had very recent first-hand experience with such tampering. 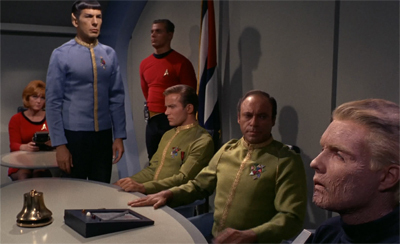 Interestingly, the episode is also set at Starbase 11, the same setting featured in Court Martial. 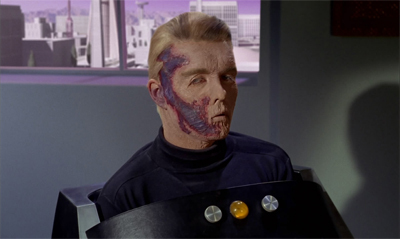 The fact that Christopher Pike was here, and it didn’t come up in the last episode, is probably the reason that Court Martial was shifted to much later in the schedule. Similarly, it’s really weird that Commodore Stone isn’t present here. Maybe he just dealt with disciplinary stuff, or maybe he was transferred away after all the crazy stuff that happened in Court Martial. Anyway, it does feel a little weird to use Starbase 11 so soon after Court Martial, but without maintaining even a hint of continuity. Not that Star Trek was great with continuity. As a case in point, the name of Starfleet is re-established here, after being introduced in Court Martial. However, the organisation will be called “Spacefleet Command“ in Squire of Gothos. So it probably shouldn’t be too surprising that the show can’t maintain a real consistency between two episodes set at the same location. That said, Court Martial and The Menagerie both do a great job extending and developing the depiction of Starfleet, and place both Kirk and Spock in a broader administrative framework. While a lot of Star Trek featured Kirk engaging in pulp sci-fi adventures, episodes like The Menagerie make it clear that this sort of thing doesn’t happen in a vacuum. I’ve been talking a great deal about world-building, and that’s something that really begins in the middle of the first season, from around Balance of Terror onwards. That’s a lot of empty space there, and it leaves a lot of room for back story. While stories so far have referenced particular events – the Earth-Romulan War, Kirk reporting Finney, the massacre on Tarsus IV – The Menagerie does the opposite. It establishes a blank space where events could be. It invites the audience to fill in that white canvas with details of these adventures and these stories. Star Trek tie-ins thrive on these gaps and these little spaces. It’s no wonder that the novels and comics have seized the rather expansive period where Pike commanded the Enterprise. I actually really like The Menagerie. Well, okay, let’s qualify that. I acknowledge that it’s a clip show. If I want to watch Pike command the Enterprise, I’ll just stick on The Cage. I don’t want to watch episodes of Star Trek about characters watching episodes of Star Trek. I don’t consider Shades of Grey the worst Star Trek episode ever written, but it’s a pretty crappy hour of television. That said, I do like some of the meta-fictional aspects, as the script intentionally draws our attention to the fact that we are watching a clip show. I’m not a big fan of watching an episode chopped up and inserted into another episode. However, I do like the framing story of The Menagerie. 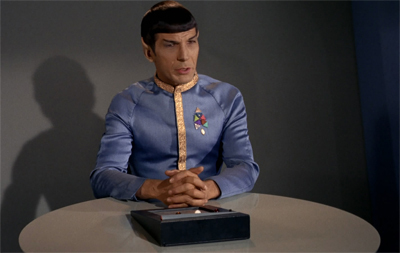 It’s a pretty great Spock story, coming only a few episodes after the first true Spock story, The Galileo Seven. Playing on the themes that are developed through most of the stronger Spock stories, The Menagerie hints at the idea that Spock is more governed by emotion than he might let on. Certainly, he actions here are sentimental, rather than logical. As McCoy and Kirk note, this conduct is not possible for a Vulcan. 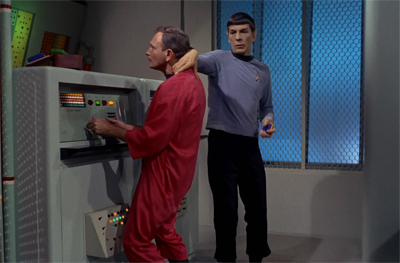 In a nice touch, The Menagerie casts McCoy as a character who has complete and implacable trust in Spock. This is a character who disagrees with Spock’s whole worldview, but still respects the man and his traditions. 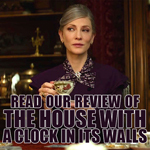 It’s a much more balanced and sophisticated portrayal than the disrespect McCoy demonstrated in The Galileo Seven. While McCoy would never give Spock the satisfaction of admitting it to his face, it’s clear that he quite likes and trusts Spock. Indeed, McCoy and Kirk both demonstrate how well they know and understand Spock, and what drives him. 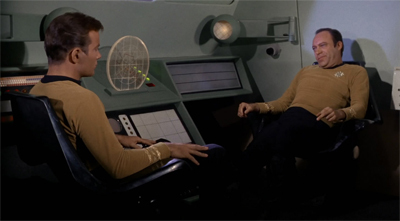 “Jim,” McCoy reminds his commanding officer, “forgetting how well we both know Spock, the simple fact that he’s a Vulcan means he’s incapable of telling a lie.” Kirk points out, “He’s also half human.” McCoy responds, “And that half is completely submerged. To be caught acting like us or even thinking like us would completely embarrass him.” Interestingly, both characters are right about Spock, even as they disagree. 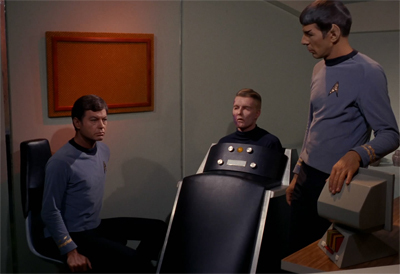 McCoy understands that Spock can’t bring himself to acknowledge his human half, while Kirk knows he can’t completely hide it. Kirk even points out the illogical and irrational nature of Spock’s plan. “If he had wanted to see Captain Pike he could have requested a leave,” Kirk tells Mendez. “I would have granted it.” It seems hard to believe that Spock couldn’t have simply bribed passage on a freighter with Pike, or even taken an especially well-stocked shuttle. As much as Talos IV is off-limits, there are no hints of orbital defences or security checkpoints. The Enterprise just flies there unmolested. Spock’s plan to hijack the Enterprise is – on the surface – most illogical and inefficient. A cynic might suggest that it exists purely to set up the court martial subplot. However, I think there’s a very clear reason for Spock to hijack the Enterprise. He doesn’t just want to bring Christopher Pike to Talos IV. He wants to take him for one last trip on the Federation flagship, probably the most high-profile ship Pike ever commanded. There’s a sentimentality there, a clear respect and affection for his old commanding officer. It’s a shame that we don’t get a better sense of the bond between Pike and Spock, even if we can intuit it easily enough. This is, after all, a nice bit of foreshadowing. 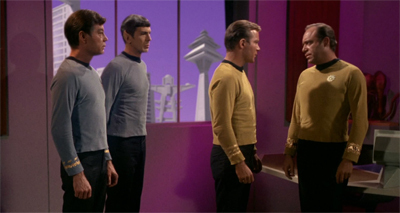 Much as Spock hijacked the Enterprise to bring an old friend some sense of peace, Kirk and his crew would eventually do the same for Spock in Star Trek III: The Search for Spock. Even this early in the series, it’s hard to believe that Spock wouldn’t do the same for Kirk or even McCoy. Indeed, it’s hard to believe that Kirk would have refused – even under penalty of death – had Spock asked this of him as a friend. Leonard Nimoy does his usual great work here. 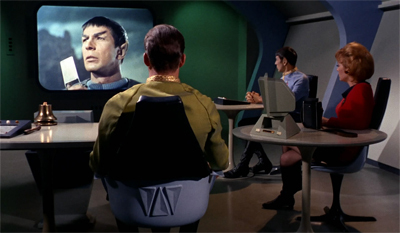 A lot of the reason that the first half of the episode works so well is down to Nimoy’s performance. Despite the fact that this is all a contrived set-up so that the production crew can broadcast an unaired pilot, Nimoy’s portrayal of Spock gives the episode a great deal of nuance. He also invests us in this particular framing adventure. I suspect that The Menagerie would probably be worth skipping entirely if it weren’t for Nimoy’s work. Indeed, it’s fascinating that we trust Spock so much that we almost immediately accept that he has a good reason for lying to Kirk, incapacitating a bunch of officers and stealing the Enterprise. The fact that he surrenders himself, and is willing to confess his crimes, also maintains the character’s dignity and audience’s trust. It seems like the show is realising pretty quickly exactly what it has in Spock, who really is one of the most fantastic characters in the history of television. There are other little touches that fit quite well with Roddenberry’s vision of Star Trek, this early in the show’s run. There’s a sense that the Enterprise is cruising along the frontier, isolated and insulated from the goings-on among the core worlds. While Spock had obviously heard somehow, Kirk is shocked to hear what has happened. “You don’t know?” Mendez asks, shocked. “You actually don’t know what’s happened to Captain Pike? There’s been subspace chatter about it for months.” It really gives you a sense that the Enterprise is truly on the frontier. It seems like the show has really settled into its characterisation of Kirk as a ladies’ man, to the point where the show is even making jokes about it. Though, to be fair, as of Court Martial, we’re reaching the point where Kirk is awkwardly bumping into ex-girlfriends at space ports. Maybe there’s a reason the Enterprise spends so much time so far out. Here, Mendez introduces Kirk to his mini-skirted assistant. “General Order 7,” Kirk clarifies. 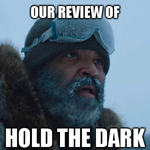 “No vessel under any condition, emergency or otherwise, is to visit Talos IV.” Mendez continues, “And to do so is the only death penalty left on our books. Only Fleet Command knows why. 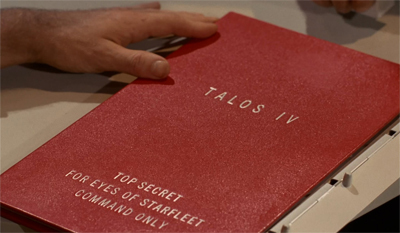 Not even this file explains that.” Not only does this suggest that Starfleet is keeping secrets (we’re also told that “the command reports stated Talos contained absolutely no practical benefits to mankind”), but also that the operational body is genuinely afraid of Talos IV. In a way that, for example, they are not afraid of the Neutral Zone or the Galactic Barrier or any other exotic locale. It’s interesting that Starfleet has these sorts of operational secrets. You might understand why a military body would keep the news of an ancient civilisation with that sort of power relatively quiet, but it does raise questions. Despite the relatively amicable terms on which Pike left, does Starfleet consider the Talosians a threat? Or was this order established with their consent? If Starfleet is so concerned about people going off to live fantasy lives so real that they would never leave, how come they go on to develop the holodeck? More than that, what other dark secrets does Starfleet harbour? The footage from Pike’s expedition is news to Kirk, so does that mean that nay of Vina’s surviving relatives never discovered what happened to her? Or any other relatives of those lost in the crash? 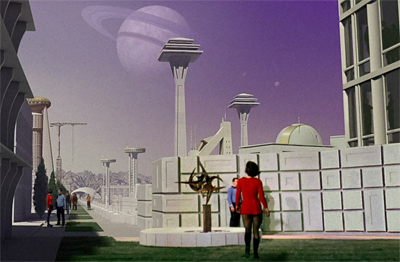 Despite the appearance of Utopia, does Starfleet take similar steps to cover up Kirk’s adventures? If the Talosians are off-limits, would Starfleet admit that the events of – to pick an example – Errand of Mercy took place? Sure, they signed “the Organian Treaty”, but is it possible that they suppressed news of how powerful the Organians were? What about things like Gary Mitchell’s insanity in Where No Man Has Gone Before or Adams’ abuse in Dagger of the Mind? After all, if Starfleet seems afraid to admit the awesome power of these aliens, it must be motivated by fear if the word got out. What would happen if people discovered that visiting the Galactic Barrier turned you into a god-like being or that Federation officials had been systematically abusing penal colony inmates? All of a sudden, the Section 31 stuff from Star Trek: Deep Space Nine and the version of Starfleet presented in The Final Reflection don’t seem so radically incompatible with Roddenberry’s vision. So The Menagerie is an interesting piece of Star Trek, even beyond being the first clip show and the first two-parter. It’s an interesting addition to the mythos, a wonderful Spock story and filled with some fascinating ideas. 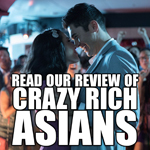 The second part doesn’t quite stick the landing, but the first part is still well worth a watch.